Make short work of your mowing job with the Bush Hog™ 100" Finishing Mower. 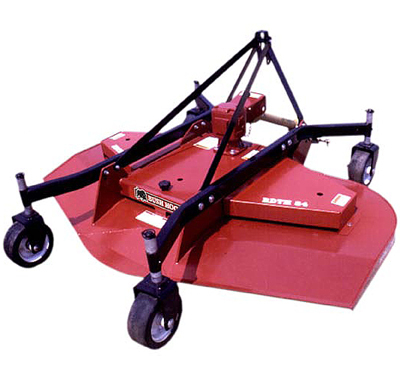 Bush Hog finishing mowers are ideal for contractors, government entities, lawncare professionals, contractors, property owners and homeowners with large lawns. Everything about these machines is designed for performance: floating A-frames, hitch arms and clevis hitch follow ground contours and provide extra protection from obstacles. Offset wheels prevent tracking and soil compaction. Three overlapping blades produce a smooth, yard-like finish. Available in widths up to 84 inches, these mowers are built for low maintenance and years of trouble-free performance.